Before we read Herb’s update on the new series recently given in Hawaii, we regret to share that there will be no eSight/Podcast this week as Herb has lost his voice and has been directed to stop talking. He is down to a whisper at best, and is praying for a speedy recovery as he has to be in Pullman, WA next weekend. Please partner with us in uplifting Herb this week in prayer for a quick recovery. May you be blessed as you read Herb’s update on the miraculous works God accomplished during the recent series. God loves. From the age of 16, I have had a passion to help others encounter this one truth: God loves. Nothing more, nothing less. Motivated by the need to help others grasp a more accurate picture of our Heavenly Father’s character through what I consider to be the definitive clue as to what God is actually like (the life and death of Jesus), I travel from venue to venue almost every weekend. On one of my trips almost six years ago now, I had a rather lengthy conversation with a gentleman I was sitting beside in first class on a cross-country Delta flight. 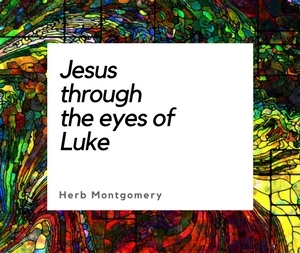 I remember my new friend saying, “I think there may be a God out there, I know I’m definitely NOT interested in Christianity, but this Jesus guy, He intrigues me.” This statement led us to engage in what I have affectionately called since then- “The Jesus Dialogue.” This new unique series of 16 presentations, grew from this interchange and represents the culmination of my ministry to date. The response was astounding. The modern Pharisees were up in arms, but the “sinners” of our present day began to let down their defenses and listen. Over the next few nights, we looked at how their pictures of God and the representation of God by modern Christianity contrasted with the revelation of God we find in Jesus. The lights began to turn on, especially on the night where we dealt with the “Problem of Evil” and how a God, if one existed, could be good in light of how things are on this earth. Some of the more notable presentations in the series included “Concentric Circles,” where we acknowledged the intrinsic worth of our beliefs and our behavior but in the light of Jesus’ teaching in John chapter 5, we would no longer be using them to get our life, identity, worth or assurance from. We began to prioritize right beliefs and right behaviors, not in the way the Pharisees did, but the way in which Jesus did instead. There is a place only Jesus is to have, and even good things, when they take that place, become very harmful. Others presentations included “What about the Bible,” which, even though it was about how to handle passages in the Bible that contradict the type of God we see in Jesus, was largely focused on the Old Testament God versus the radically different revelation of God we find in Jesus. The response to this presentations was tremendous. For one atheist in particular, the Jesus Dialogue was a turning point in his life. By the end of the series, he was still very leery of Christianity, but he had begun to embrace Jesus as His God and Lord. I felt, given this man’s own life story, that this was HUGE! We ended the series with eight baptisms, one of which was a 20- to 30-something who had left the church but, given what he had seen about the character of God through Jesus, was coming back. I was blessed with the privilege of baptizing this young man myself. Last, without mentioning names, there were two very special people who attended this series. I was introduced to them on opening night and immediately tears came to my eyes. You see, there is a section of our society that doesn’t frequent “church” very often, much less come out to a series being hosted by a church. I have, for years now, felt a great burden on my heart for parts of our modern culture that our church isn’t even touching much less reaching. Yet, here they were. They had seen the advertising, been invited by family and friends, and said, “Yeah, this looks different.” So they came, night after night, to learn what this Jesus was truly all about. As a truer picture of God’s character began to unfold, they approached me one evening and stated, “We want to follow a God like that. What is keeping us from being baptized?” Over the next two weeks, I fell in love with my two new friends, and I’m happy to share that they made the decision to follow Jesus. Their journey will look different from mine, but even at that I have to chuckle. Which one of our walks with Jesus looks the same as someone else’s? We are all unique, with unique backgrounds and unique present situations. And although yes, God has His ideal, He, in His love, is ever tailoring that ideal to our very non-ideal situations, reaching us where we are at, and patiently growing us into what He sees we can be, an image of His perfect love. I’m just thankful to have been a part of the beginning of my two new friend’s journey. Please keep them in your prayers as they continue to grow with all of us now. They are raising a son together and want so badly to raise him with their newfound knowledge of God’s love. And, if you’re out there reading this, I love the two of you so much. You both are precious to me. Meeting you two was a defining moment for me in my own journey with Jesus. Thank you for changing me, too.